Ideology and style are not the only things dividing Obama and Romney heading into Election Day. The candidates also have very different approaches to mobilizing their base voters, especially on the Internet, where campaigns can now reach millions of supporters directly. Romney’s website, which is sure to see a surge of last-minute election traffic, was still devoting its valuable front-page real estate to a pitch for harvesting new e-mails. The site also offered a few other options for visitors to click—such as donating, volunteering and closing arguments. The last two days of an election are no time for recruiting new e-mails and volunteers, however. 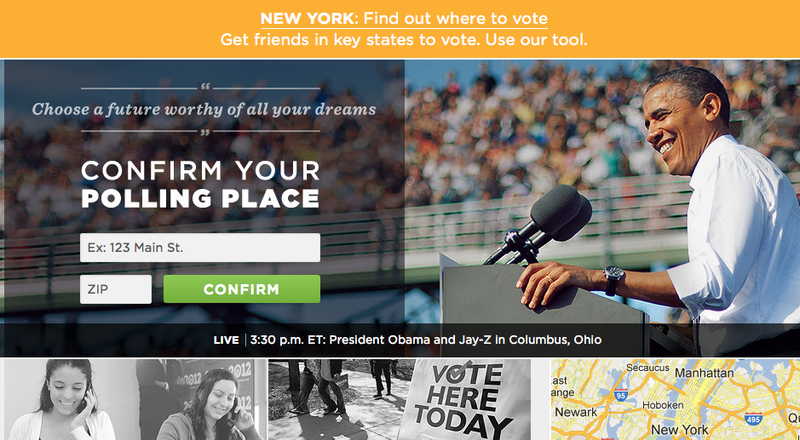 A more field-focused approach was evident on Obama’s homepage. Now, when it comes to digital politicking, it’s worth recalling that two of the most common criticism are that: (1) it’s divorced from reality on the ground; and (2) it primarily involves echo-chambers of like-minded citizens. For election mobilization, however, any echo effect is a benefit, because campaigns are done with persuasion. They only want to contact supporters for voter mobilization. (After all, turning out opponents is a negative return on investment.) And the test for the field efficacy of online outreach depends on the strength of the networks being activated (not the technology itself). The Obama campaign—which has spent years cultivating resilient networks of supporters who are as comfortable clicking to donate as they are walking neighborhoods to mobilize—is betting that its online platforms provide one more small edge in a tight race. President Obama also has an early voting advantage in Ohio. Ari Berman reports.